Yesterday I had my first council meeting where we debated many issues, including reintroducing fluoride into our water system. In case you missed it, council voted in favour of reintroducing fluoride by a vote of 8 to 3. Assigned to City Planner Asks that Planning and Building department provide Council with an update on the status of the Sandwich Town Community Improvement Plan (CIP) and further determine if additional incentives and improvements could be made to the CIP. Have your say on the future look of University Avenue. See the link below for more details. Hope to see you there. These past 24 hours have been very special. I first want to thank Councillor Elliott for his service to the City and his lifelong service to our community. He has mentored thousands of youth and has already left a legacy that is second to none. This campaign would not have been possible without the support (and great help) of my wife who organized all of our major events; from flyer drops to lawn sign blitzes to E-Day. She spent countless hours canvassing door-to-door with me as well. She's a ROCKstar. To the residents who pushed me to run and who have volunteered hundreds of hours to the campaign: THANK YOU. We had an incredible team who were passionate, energized, committed, generous and very hardworking. It was a true team effort that I know will continue for years to come. This campaign has been an incredible journey. Thank you for your support, and thank you for speaking with me about the issues that matter to you. Together, we can do something very special, vote by vote, neighbourhood by neighbourhood. Let's get it done! Election Day is Monday, October 22nd, from 10am to 8pm. Bedford United Church is hosting it's annual Turkey Dinner on Saturday, October 20 between 5pm and 7pm. Bedford United is located on 3340 Sandwich St. You can reach them directly at 519 256 1131. Parking access off of Russell St.
Advance Polls Open on October 6th! Hi friends, advance voting begins on October 6th at Devonshire Mall. Two other advance polls near Ward 2 include the Capri Complex (formerly South Windsor Arena) on October 9th and the Aquatic Centre on October 10th. Please vote early if you can and thank you so much for your support! See below some events that are coming up. One on Friday for Assumption in support of the Welcome Centre Shelter, and one on Saturday in support of the Bloomfield House. 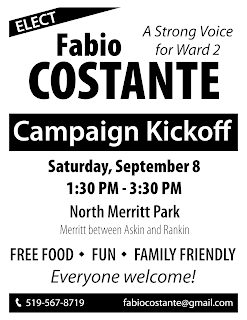 This Saturday (Sept. 8) between 1:30pm and 3:30pm, we are hosting a campaign kickoff at North Merritt Park. Please join us and feel free to invite your friends and neighbours. There are more details in the flyer below. Hope to see you there! You may have heard that I've entered the race for City Council in Ward 2. We have been overwhelmed by the support and encouragement since we filed on July 3rd. We have set up a website for the campaign, along with a facebook page. We will regularly update you as we go along. We are excited to continue our community work that started nearly a decade ago, and we look forward to bringing your voice and concerns to City Hall. There is a new artist in Sandwich Town, located on Sandwich Street between Rock Bottom and Buddies Eatery and Tap. The artist is Jeffrey Gregory and his space is called "Art for Everything." 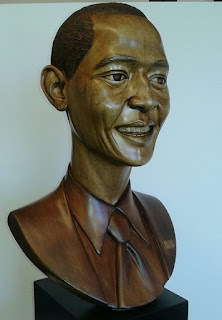 Please check it out when you have time -- he has some great work in his studio space -- and please spread the word. Entrepreneurs and artists make our neighbourhoods vibrant and contribute significantly to our quality of life. Please help support our local artists! Below are some pics of his work. As you will see, he is very talented. "Please note that cars on California between Tecumseh and California were also broken into and items were stolen." Please report this to Windsor Police so they are aware! See a message I received below from a west-end resident on Josephine Ave. It's that time of year. Today we found our car door ajar. Someone went through it, but THANKFULLY didn't take anything. Forgot to lock it. Please give a heads up. We live in the 900 block of Josephine Avenue. I have some great news. 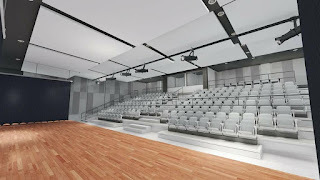 Yesterday, the Board of Trustees unanimously supported a new $1.14 million theatre for Assumption high school. This has been a project we've been working toward for several years and I am very grateful for the trustees' support, along with administration's diligence, in seeing this through. Great news for our students, Assumption family, and the west-end! Below is a link to the media release, along with some news stories and artistic renderings of the space. I have some personal good news. I have recently started my own law practice and will be located in Sandwich Town (corner of Sandwich and Mill) at the historic Robinet Building, right across from the old post office. If all goes well we should be open within a month or so. 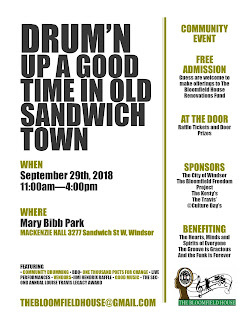 Like you, I believe very much in Sandwich Town and I'm excited to be part of its revitalization. Feel free to stop by once we're open. Cuddles is open every Friday & Saturday 9am to noon. Free kids clothes, shoes, coats and toys @ 1636 Tecumseh Rd. West. We also accept good clean kids clothes. 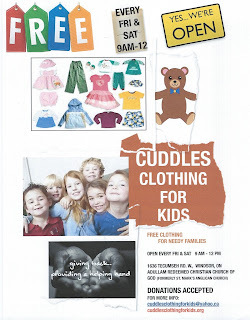 Pass this on to anyone looking for clothes for kids. Good selection. Assumption Church is too important to the west-end and the community at large. It is too important to close. Please let your voices be heard on this very important community gem. The Our West End Neighbourhood Renewal held their 3rd annual Biz West Networking night at Jimmy G's on Wyandotte St. W. Below is a link featuring the event by BizX Magazine who helped promote and host the evening. A big thank you to Tammy Murray, Leo Gil, and all of the volunteers who made the evening a big success. Many businesses were in attendance, networking and sharing ideas to make their business and west-end community better. If you are a business owner or a resident interested in making your community better, get in touch with the team at Our West End. Lots of good things happening! See below a message from Leo and Tammy, outreach coordinators at Our West End. There will be a town hall with Windsor Police, the University of Windsor, and local residents and businesses in River West. Hope to see you there! Please find attached an invitation for the community conversation Town Hall residents are leading in the Riverwest neighbourhood in advance of St Patrick’s Day celebrations. The Riverwest residents have created this event to begin a dialogue with the University of Windsor’s newer Administrators and Windsor Police Services in response to ongoing neighbourhood concerns. The Our West End Roundtable is invited to help support the efforts of Riverwest residents who have been working on these issues for over a decade. See an article below regarding Transit Windsor looking to change its bus terminal location. There is a public consultation session on Thursday beginning at 4pm. More details in the link below. See below from Tammy Murray and Leo Gil at Our West End Neighbourhood Renewal. Please feel free to circulate with your contacts!